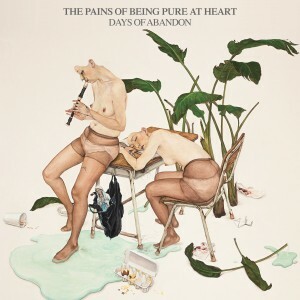 The third full length album from New York’s The Pains of Being Pure at Heart continues the band’s trajectory as darlings of the indie-pop world. Days of Abandon is also an emblem of changing times marking the departure of long-time Pains member, Peggy Wang, moving from Slumberland Records to Yebo Music, and creating a collection of songs that tend to lean more toward high gloss pop than band’s original lo-fi dream-pop. The 10 song format for Pains’ studio albums is again carried forward on Days of Abandon, but the range of songs in its catalog is much more dimensional than we’ve seen on previous albums. Devotional heart thumping songs with Kip Berman’s sweetly written lyrics and dreamy melodies are still there (“Beautiful You” and “Until the Sun Explodes”). That should please die-hard fans of the band’s self-titled debut and sophomore effort, Belong. But a varied sound has also noticeably progressed on Days of Abandon with the addition of A Sunny Day in Glasgow’s Jen Goma taking over lead vocals on “Life After Life” and “Kelly” and the inclusion of new brass instrumentation on “The Asp at My Chest.” Yes, it is more of a “produced” album i.e. the gauzy filter has been removed. If you consider Days of Abandon in a vacuum, it is an enormously appealing album that objectively depicts Pains’ sonic horizon with its endearing pop sensibility. Line it up next to the band’s previous two albums and Days of Abandon is just as likely to receive criticism for straying too far away from 90s nostalgia. Have a listen and decide which side of the line you fall on.